The administration of U.S. President Donald Trump says all eligible small children separated from their families as a result of its zero-tolerance immigration policy have been reunited with their parents. Forty-six children under five years old weren't reunited with families because of safety concerns, the deportation of their parents and other issues. The administration of U.S. President Donald Trump says all eligible small children separated from their families as a result of its zero-tolerance immigration policy have been reunited with their parents. But nearly half of children under five years old remain separated from their families because of safety concerns, the deportation of their parents and other issues, the administration said. The administration was under a court mandate to reunify families separated between early May and June 20, when President Donald Trump signed an executive order that stopped separations. 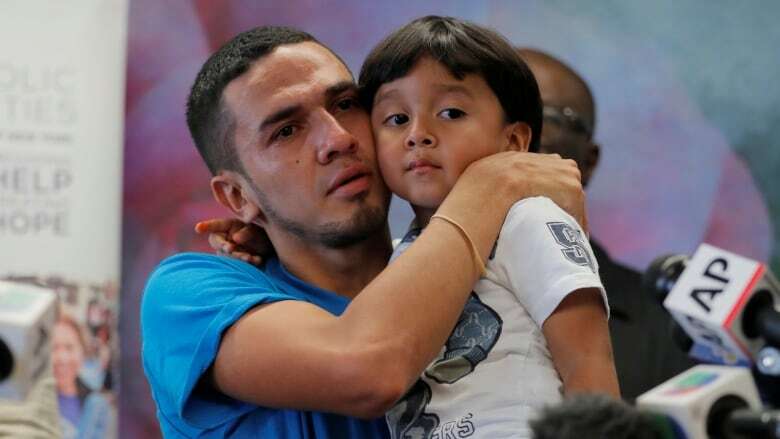 The American Civil Liberties Union filed a lawsuit on behalf of a woman who had been separated from her child, and U.S. District Court Judge Dana Sabraw ordered all children reunited with their parents — children under five by July 10, and older children by July 26. Sabraw, an appointee of President George W. Bush, over two weeks issued a nationwide injunction on future family separations, unless the parent was deemed unfit or didn't want to be with the child. On Monday, he said the total of kids under five that needed to be returned was just over 100. ACLU lawyers said that regardless of the reunifications, the government missed the court-ordered deadline of Tuesday and would be deciding how to address the non-compliance with the court. "If in fact 57 children have been reunited because of the lawsuit, we could not be more happy for those families. But make no mistake about it: the government missed the deadline even for these 57 children," lawyer Lee Gelernt said. The officials said 46 of the children were not eligible to be reunited with their parents; a dozen parents had already been deported and were being contacted by the administration. Nine were in custody of the U.S. Marshals Service for other offences. One adult's location was unknown, they said. In 22 other cases, adults posed safety concerns, they said. Officials said 11 adults had serious criminal histories, including child cruelty, murder or human smuggling. Seven were not determined to be a parent, one had a false birth certificate, one had allegedly abused the child. Another planned to house the child with an adult charged with sexually abusing a child. Trump signed an executive order on June 20 to stop the separations concerning asylum seekers after its zero-tolerance approach announced earlier in the spring had raised a furor. Federal officials have been scrambling to reunite the children under the deadline set by Sabraw. Part of the issue, administration officials said, is that the systems weren't set up to get parents back together with their children. Health and Human Services manages their care inside the U.S., while Homeland Security has control over adults in immigration detention, and the Justice Department manages the immigration courts. The administration defended its screening, saying it discovered parents with serious criminal histories, five adults whose DNA tests showed they were not parents of the children they claimed to have and one case of credible child abuse. The 46 children will remain in the care of Health and Human Services, which will continue to seek to place them with a sponsor, such as other family members or even foster care, as it does for the more than 10,000 other minors who arrived in the U.S. without a relative. Children spend an average of 57 days in shelters before they're placed with a sponsor. They are given access to medical care and counselling, as well as school. The administration faces a second, bigger deadline — July 26 — to reunite more than 2,000 older children with their families. Immigration lawyers say they already are seeing barriers to those reunifications from a backlog in the processing of fingerprinting of parents to families unable to afford the airfare to fly the child to them — which could run as high as $1,000 US. After the executive order was issued, the administration said it would seek to detain the families together indefinitely, much like a similar attempt by the Barack Obama administration, but that has so far been blocked by the courts. A different judge, in Los Angeles, on Monday dismissed as "dubious" and "unconvincing" the U.S. Justice Department's proposal to modify a 1997 settlement known as the Flores Agreement, which says that children cannot be held in detention for long periods, irrespective of whether they're with their families.